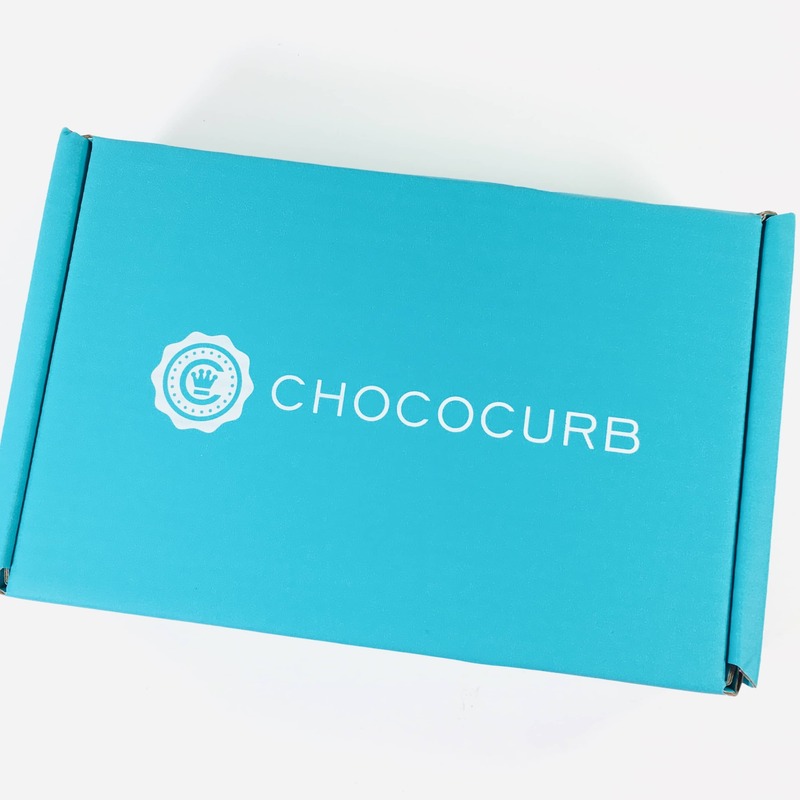 Chococurb is a monthly subscription for chocolate lovers! The chocolates sent are premium, gourmet brands and are sometimes exotic. 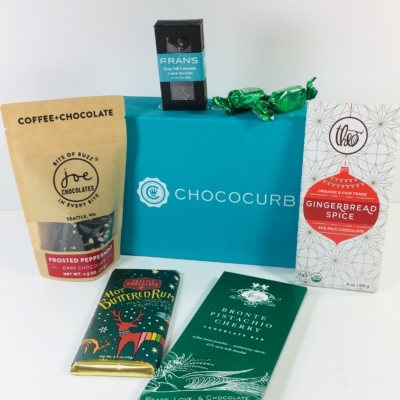 You can choose from the Chococurb Classic Box ($40), which has 5-7 items, or choose the Chococurb Mini ($20), which has 3 items for smaller appetites. 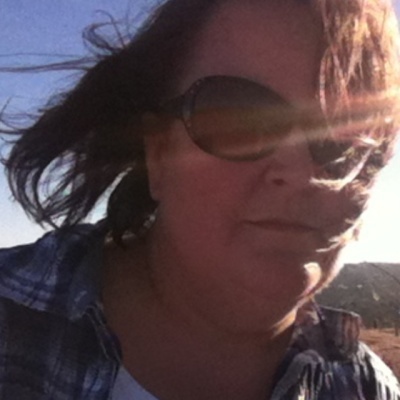 I am reviewing the Classic Box! 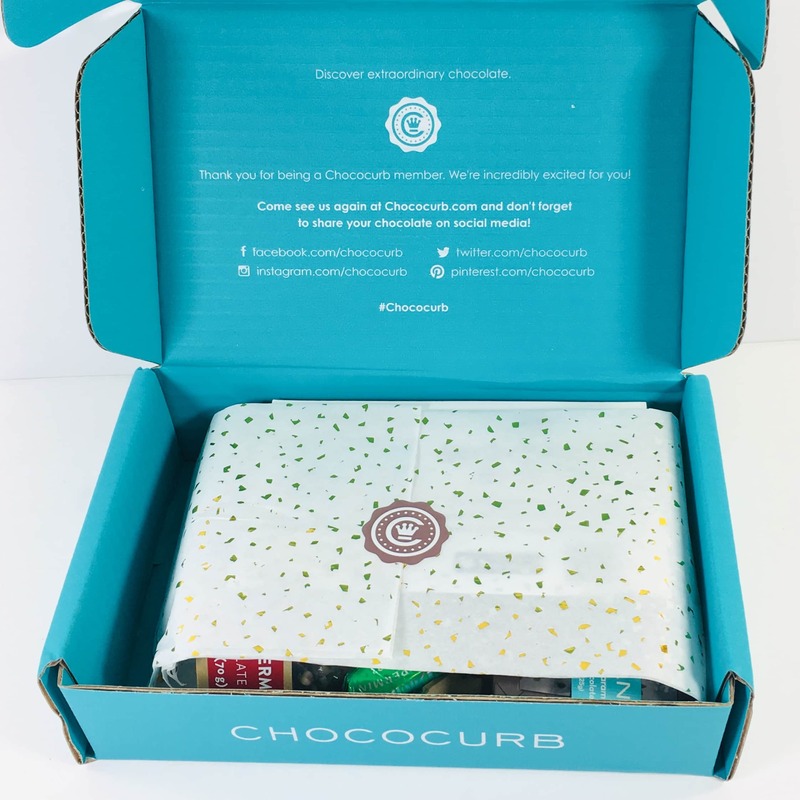 The presentation was simple, with gold-flecked tissue paper and a Chococurb sticker. 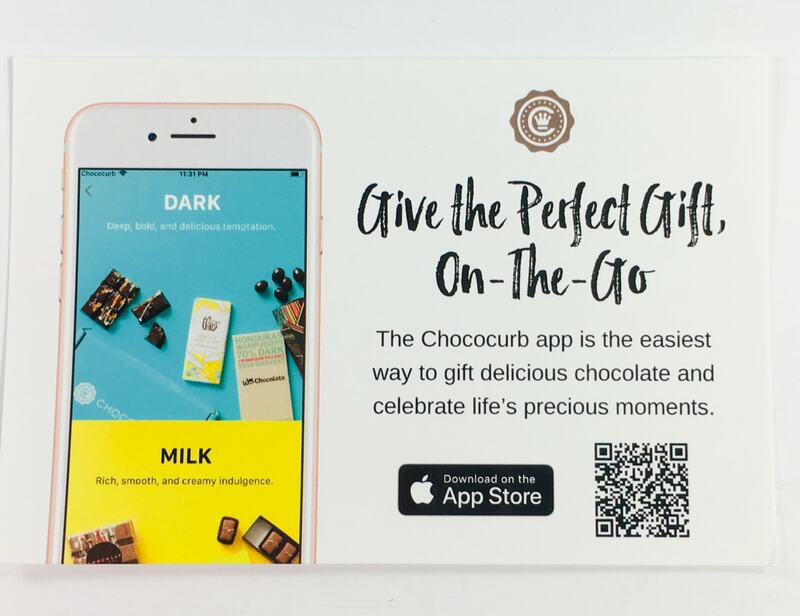 No product info card, but I did receive a card telling me about the Chococurb app! 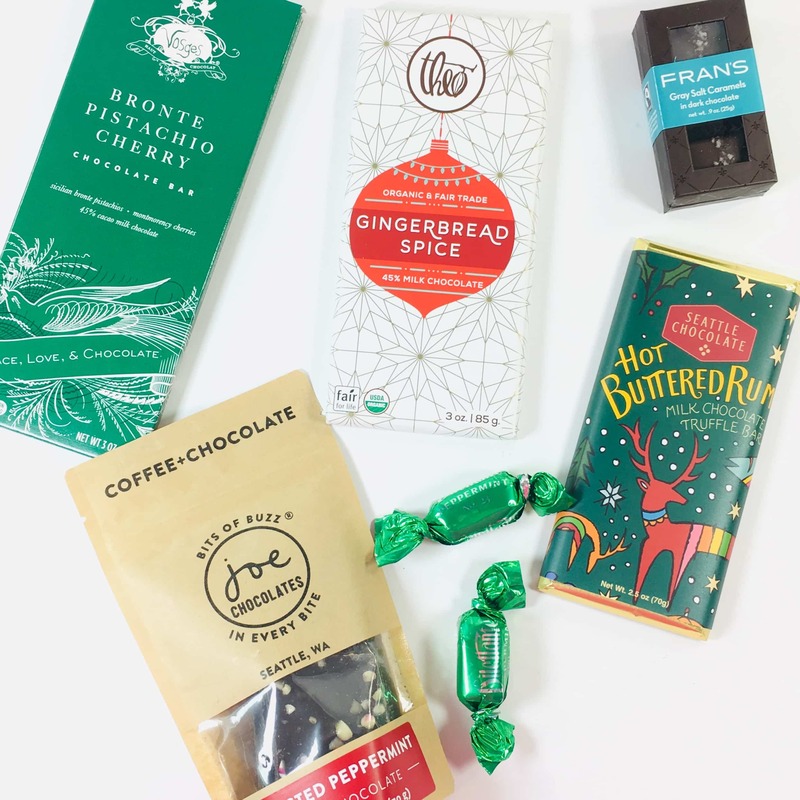 I love this subscription, so many yummy bars to choose from! 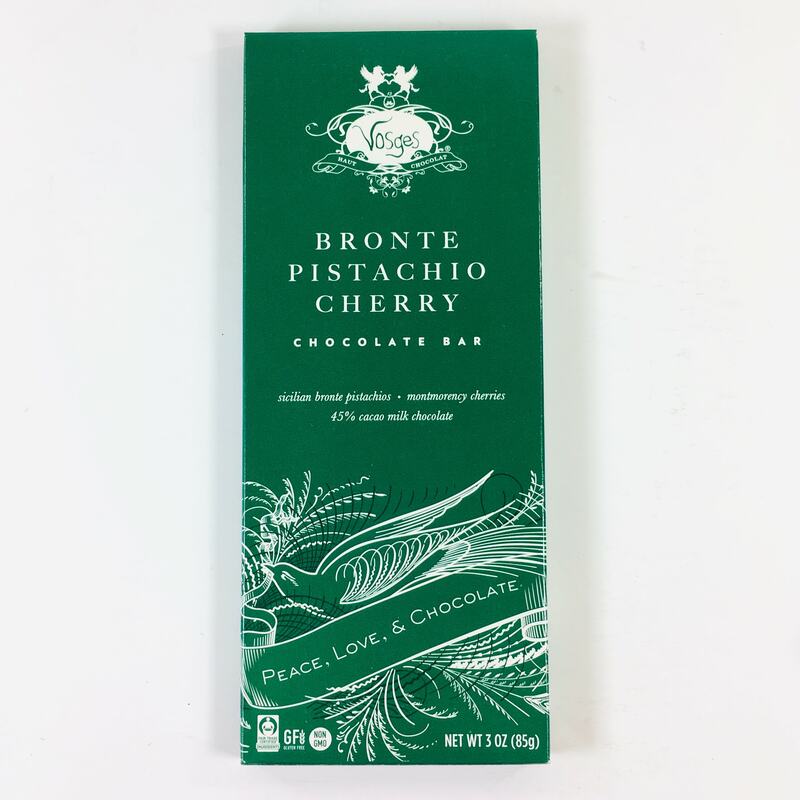 Vosges Bronte Pistachio Cherry Chocolate Bar ($8, now $6.40) A couple of the items in this box are ones I’ve tried before, like this totally delicious chocolate bar! Pistachios from the foot of Mt. 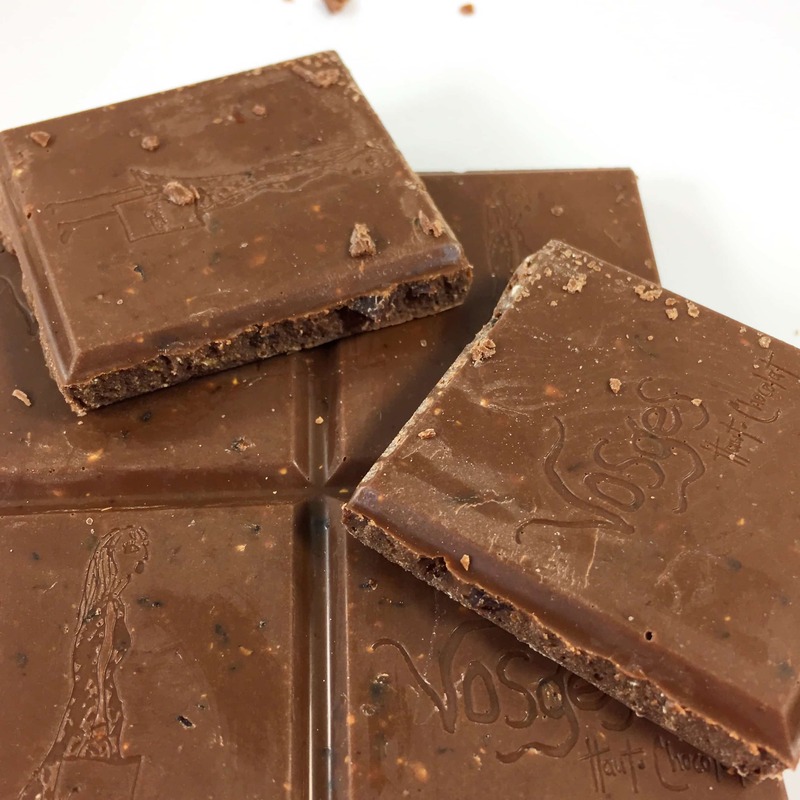 Etna are combined with Michigan cherries and a hint of sea salt, all in a base of milk chocolate. The combo of flavors and textures is extraordinary and this is one of my all-time favorite discoveries. 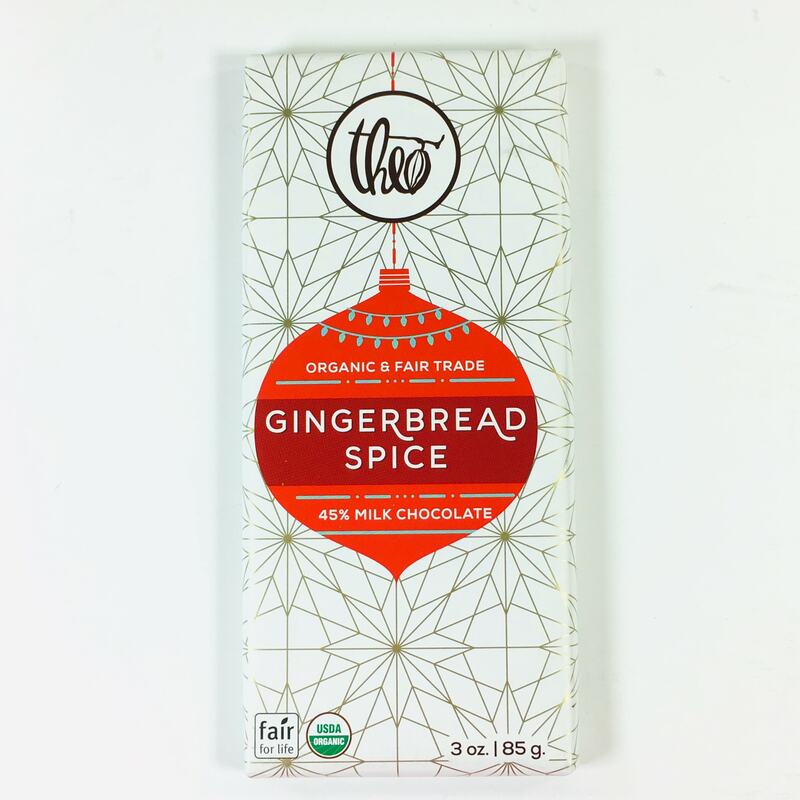 Theo Gingerbread Spice 45% Milk Chocolate Bar ($3.99) I wasn’t sure that I would like this, but it turned out to be tasty! 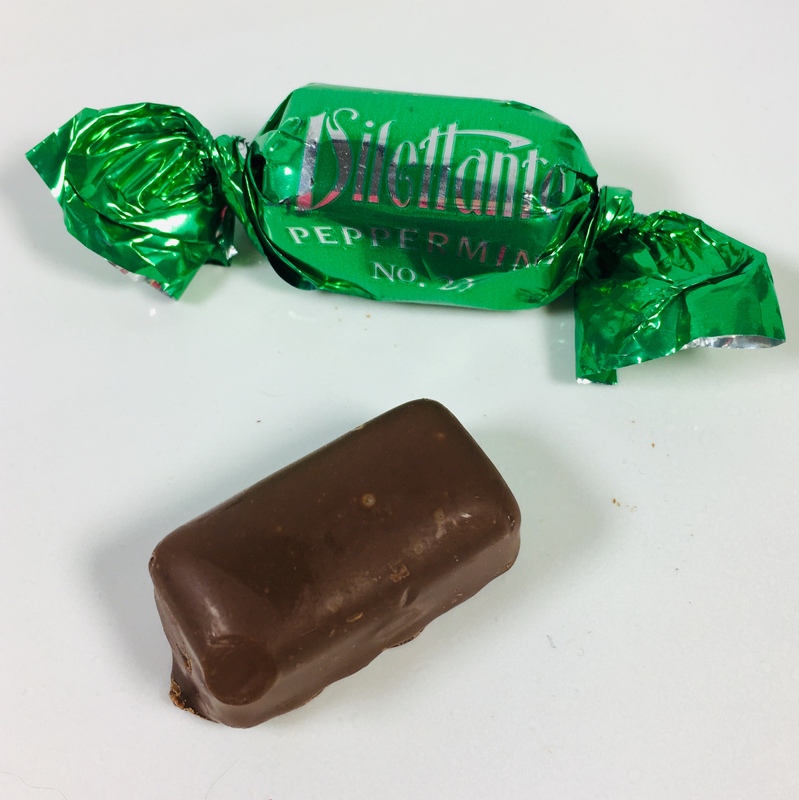 I used to gnaw some of the Mexican hot chocolate tablets when I was a kid, and this had a similar flavor. 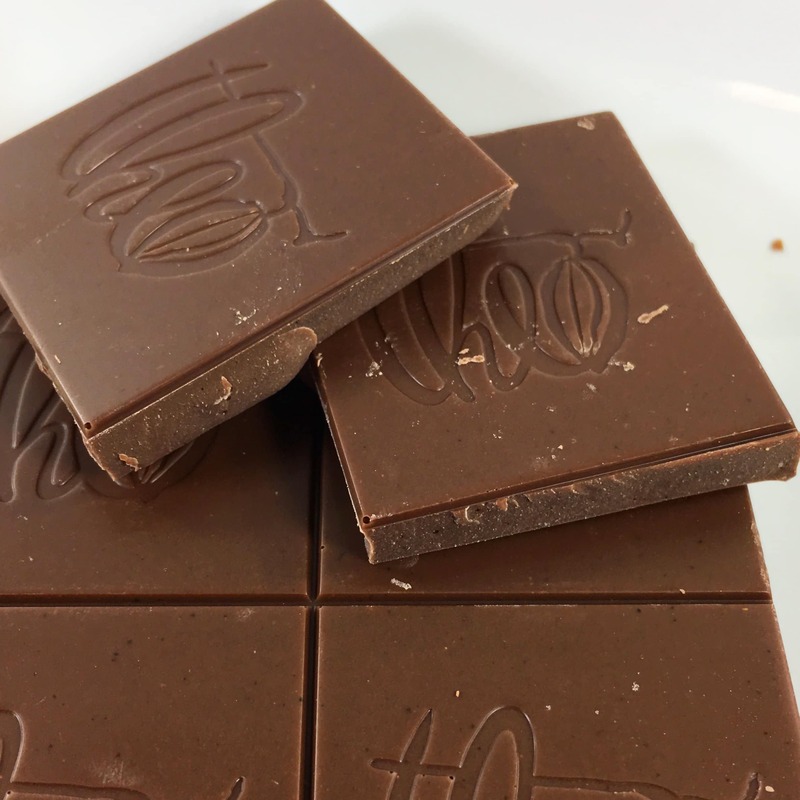 Cinnamon is one of the spices used and it always seems to go well with chocolate. 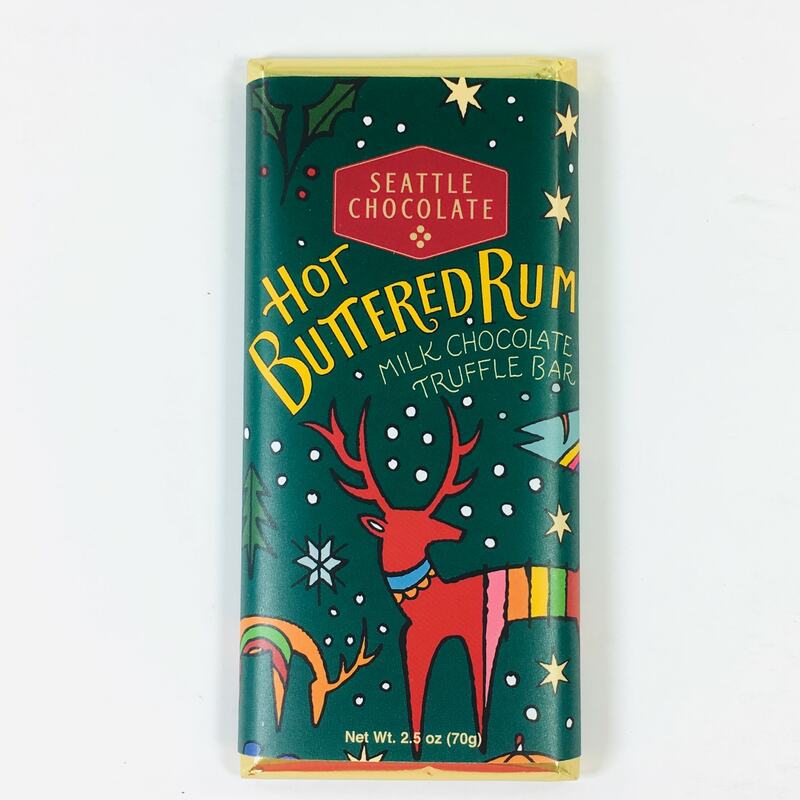 Seattle Chocolate Hot Buttered Rum Milk Chocolate Truffle Bar ($4.50) I’ve never had a hot buttered rum but I think I need to try one soon. 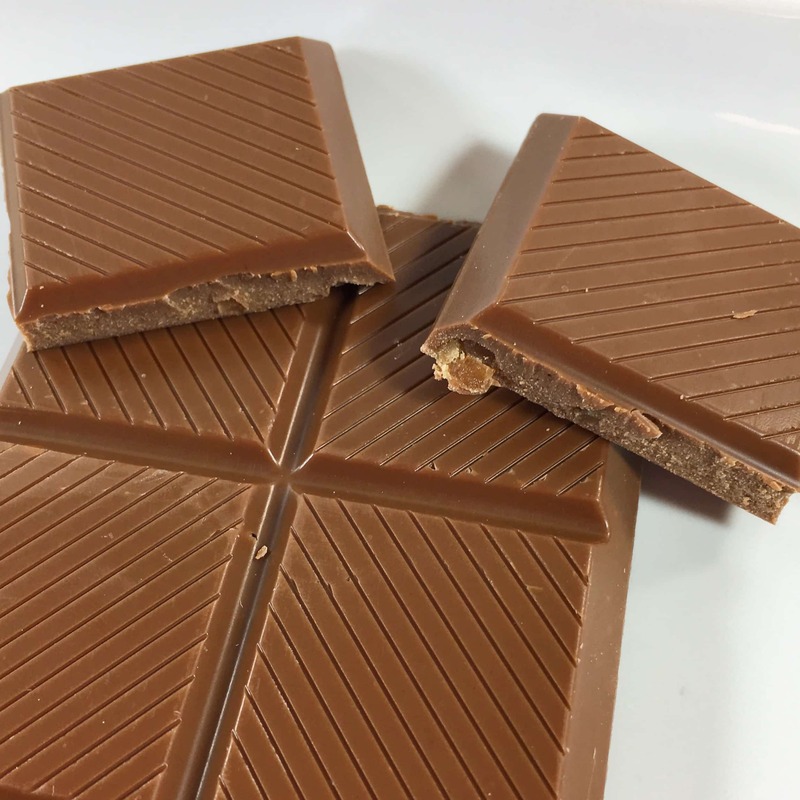 Small bits of toffee are mixed into butter rum flavored milk chocolate. So good! 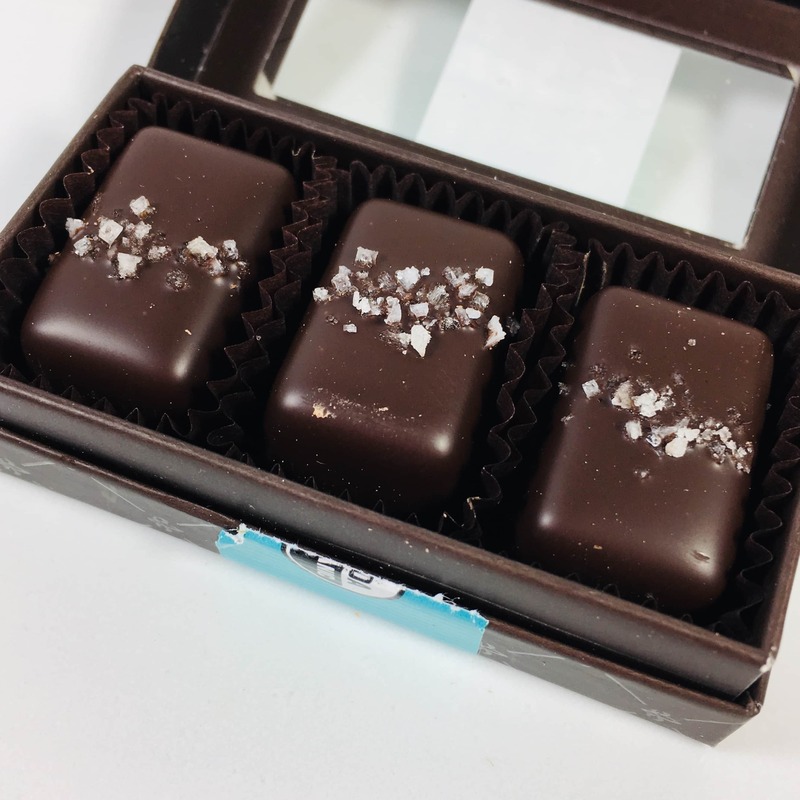 Joe Chocolates Frosted Peppermint Dark Chocolate ($7) Joe Chocolates shows up on occasion and this one is perfect for the holiday season. Keep in mind that one bag has the same amount of caffeine as two cups of coffee! 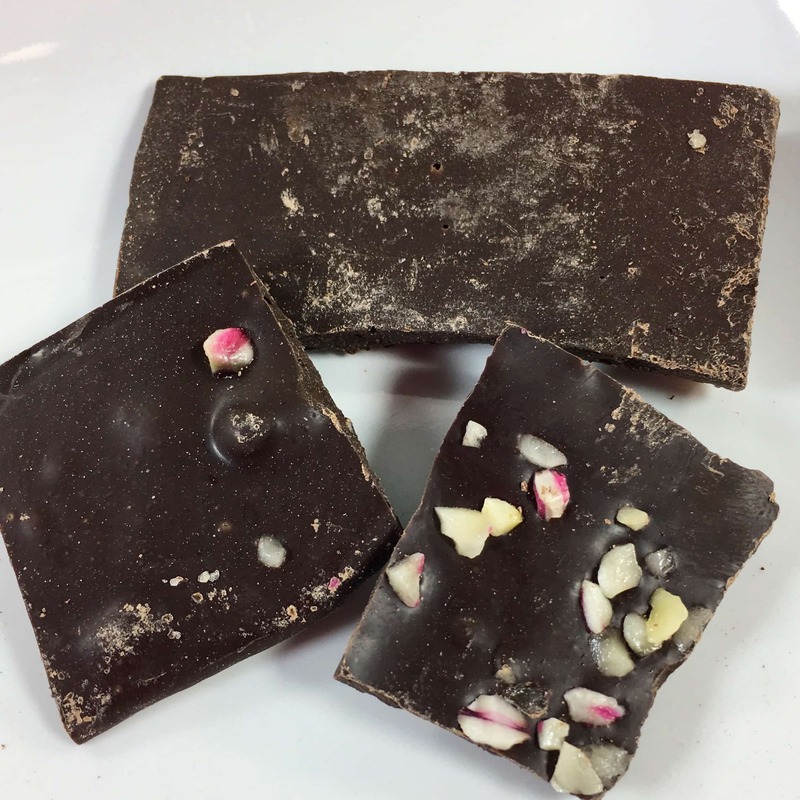 Roasted coffee beans are mixed into dark chocolate and then covered with chopped peppermint candy, before being broken into pieces. 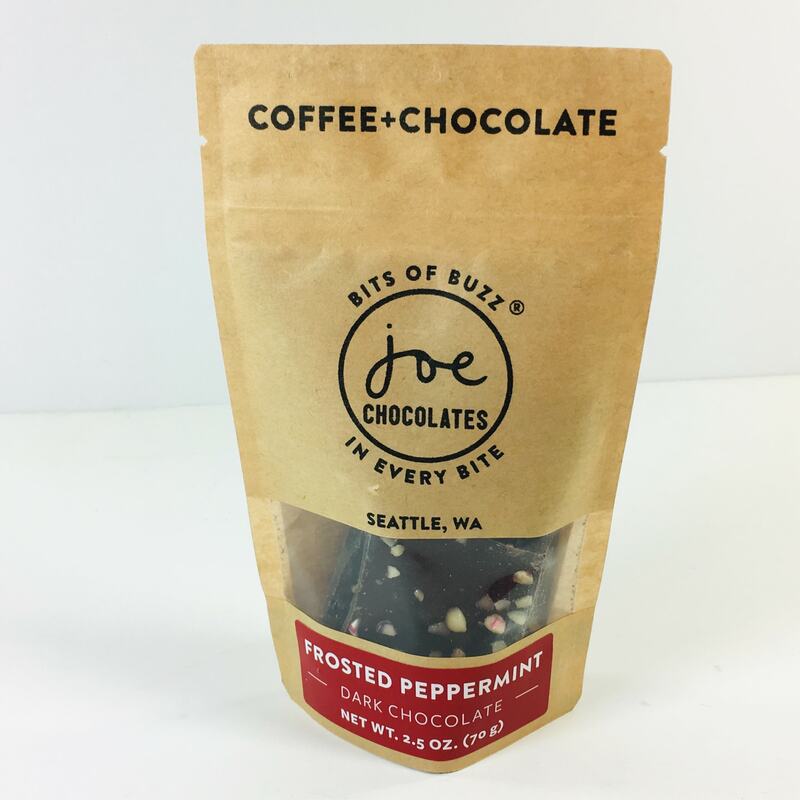 If you like Starbucks Peppermint Mocha then this is the candy for you! Soft and buttery is correct, plus that touch of saltiness from the sprinkling on top just gets my mouth watering. 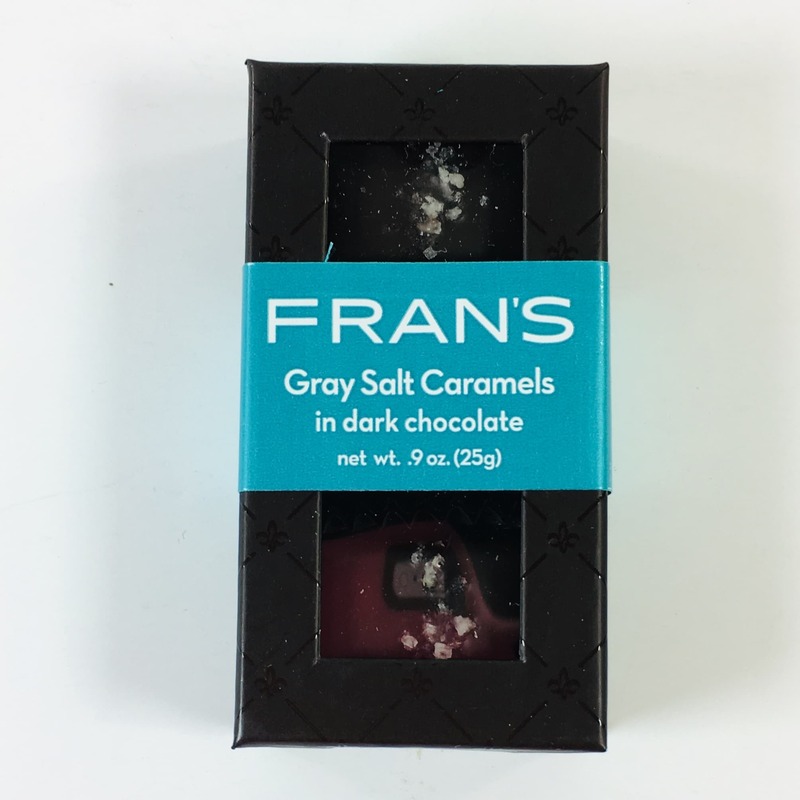 I think Fran’s has one of the best caramels I’ve ever tried. 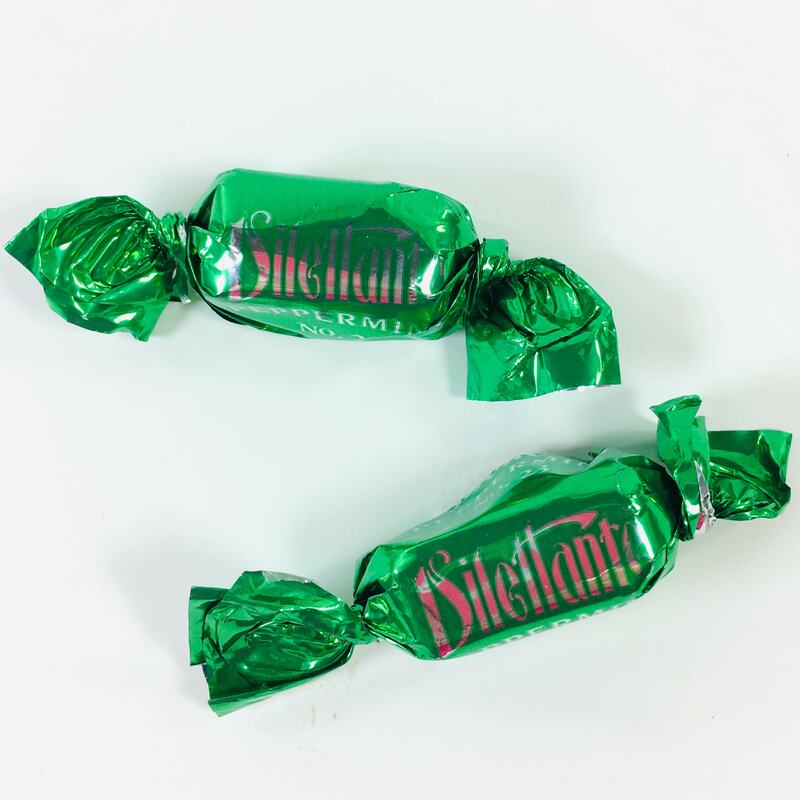 I love the combo of chocolate and mint and these are certainly a step up from Junior Mints. The inside is chocolate ganache that’s covered in milk chocolate and I let it slowly melt in my mouth. 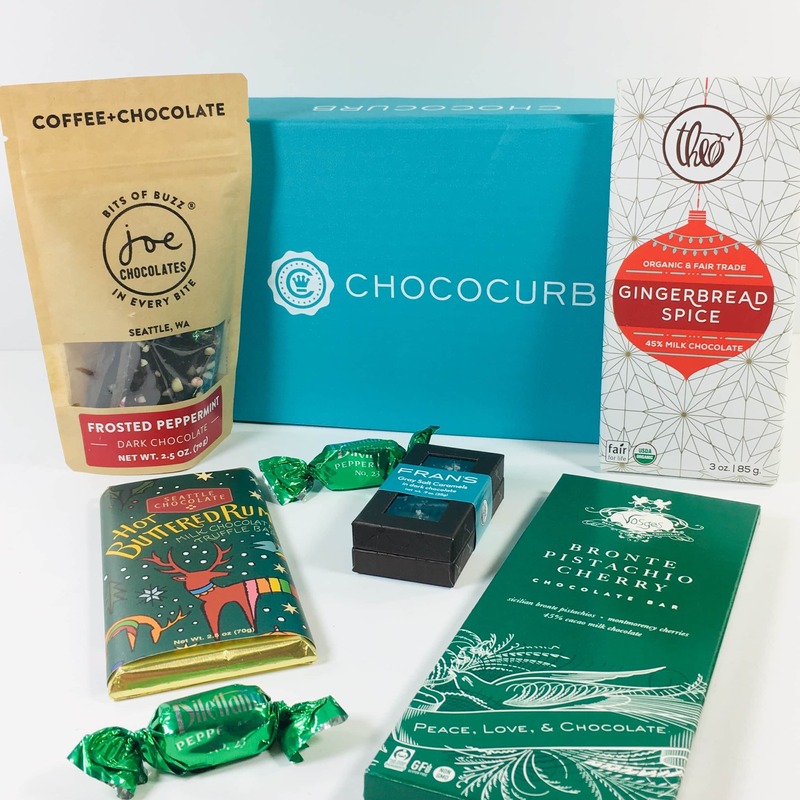 I loved all of the different, seasonal flavors in the December Chococurb! This subscription has seriously upped my chocolate appreciation, the quality is always superb. 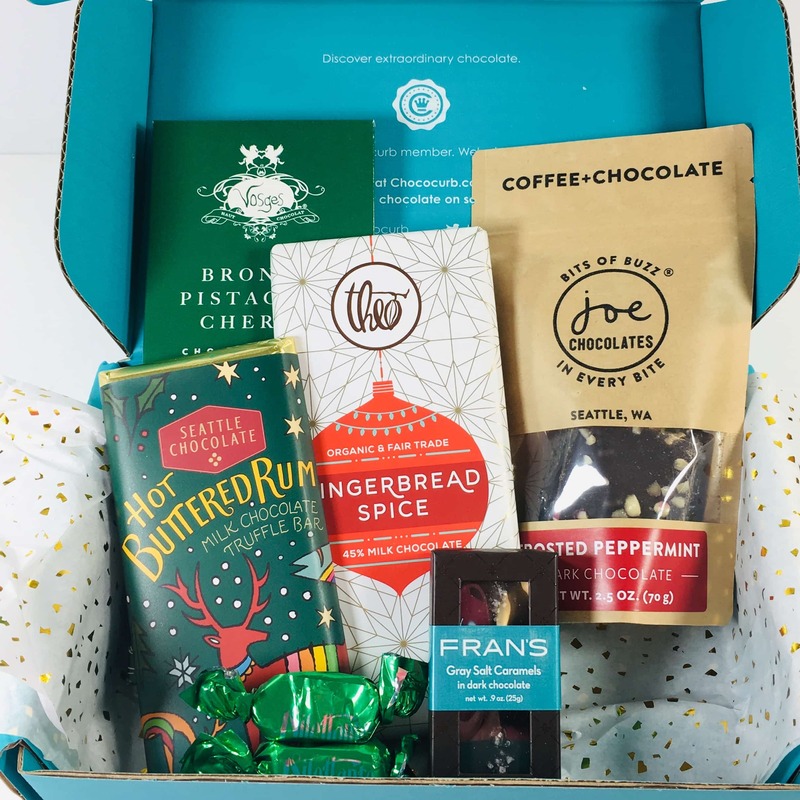 I’m a fan of all kinds of flavors but you can choose the types of chocolates you like when you sign up to personalize your box.